Not long after I joined a 24 Hours of LeMons team, I attended a barbecue at a friend's house. Friend's husband, Darren, is a motorcycle mechanic, so naturally all the gearheady guys gravitated to the garage to look at grimy machinery and listen to The Atomic Bitchwax on the garage boombox... and then I saw it. Just lying there on top of a box of Honda pistons was an old battered Mr. Gasket Street Scoop. Yes! Turns out it came installed on a '65 Chevy pickup Darren bought for bike-hauling purposes, and the first thing he did upon taking delivery of the truck was to remove the scoop and fill in the crudely hacked hole in the hood. "I must have that scoop for the race car," I told him. "How much you want for it?" I didn't quite grab him by the lapels and shake, but there was no mistaking my air of urgency. Darren's price was very reasonable, as in free ("What the hell do I want with this redneck thing? Take it! 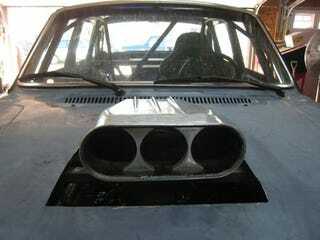 "), and now we've gone ahead and installed it on our Ford 302-powered '84 Volvo DL. Sure, we still don't have the car moving under its own power yet, nor do we have working brakes, but priorities are priorities! Team members Wayne and Dave are proud of their precision hood-modifying handiwork, and rightfully so. I figure this thing is good for at least 100 horsepower, maybe more. You see, it's a well-known automotive fact that you get 100 horses per scoop (and another 50 for each inch of tailpipe diameter, not to mention 25 for each square foot of wing surface), so this gives us quite an edge over the competition.